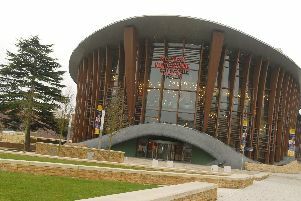 Fresh from a hugely successful fourth series of Gino’s Italian Escape on ITV, Gino D’Acampo is taking his passion and flair for Italian cookery to a live audiences at Aylesbury Waterside Theatre. His live stage show on Monday May 8 promises signature recipes from all corners of his beloved Italy, blended with Gino’s irrepressible humour, audience participation and plenty of surprises along the way. A proud and fun-loving Neapolitan, Gino is one of the most popular personalities in his field; alongside regular appearances on This Morning, he presents the hugely successful Gino’s Italian Escape and has released several best-selling books including Fantastico!, The Italian Diet and A Taste of the Sun. His live show will see him demonstrate how to cook some of his favourite dishes from his popular Italian Escape series – and he’s sure to be inviting some lucky audience members to join him on stage for a memorable, up-close experience. For further information about the show or to book tickets call the box office on 0844 871 7607 or www.atgtickets.co.uk/aylesbury.